Ski from your front door and back again to the largest ski terrain in the USA. Big Sky and Moonlight Basin, beyond compare with over 5,500 skiable acres, 4,350 feet of vertical drop, 220 runs and 24 lifts, pure powder out your back door! 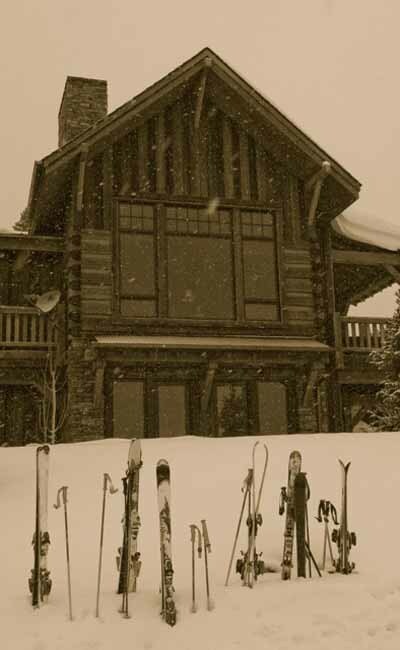 Easy ski access to equipment rentals, gear shops, ski school and restaurants. New to the rental market, this property is located on a sunny point surrounded by mature lodge pole pines and is part of Moonlight Basin's newest property - Alpine Meadows. This magnificently furnished, 4 bedroom, 4.5 bath 2,300 square-foot vacation home has unparalleled views of the Gallatin Range, Spanish Peaks, Andesite Mountain, Lone Peak in addition to sweeping valley vistas. Perfect for single or a multi-family vacation, a trip with old friends or a quick getaway, this LUXURY home is the spot for you! Experience the ultimate ski or summer escape. This home is located within walking distance to Moonlight Lodge, ski to Big Sky Mountain Village or a short 5-10 minute drive to both Big Sky Mountain and Meadow Villages. In addition to uncrowded pristine powder you are nearby shopping, spas, fantastic cross-country skiing, snow tubing, snowmobiling, dog sledding, sleigh ride dinners and ice skating. In the summer, you have backdoor access to outstanding biking and hiking trails, horseback riding, white water rafting and the rodeo. Fly fish the world's top trout streams. The Gallatin, Madison and Yellowstone rivers are a quick drive away. We are located 30 minutes from Hebgon Lake and 45 minutes from Yellowstone. There are many other outdoor adventures including summer concerts and kids activities. It is also common to see elk, deer and moose without even leaving your front door! Come visit and enjoy radiant floor heat throughout the home and three fireplaces. Cozy up with a good book next to a beautiful fully stocked wood burning fireplace or venture in to the hot tub to relax and take in the magnificent sunny and snowy views. Did we mention that Big Sky averages 400 of inches of snow in the winter that you don't have to shovel? Parking and decks are shoveled daily with equipment storage available in our garage. Enjoy technology while away from home with in home access to Wi-Fi, Direct-TV, multiple wireless phones, iPod docking station with CD capability and a Big Screen TV w/DVD player. For the foodie, cook in our gourmet kitchen magnificently appointed with granite and natural stone. Professional grade stainless steel appliances adorn the kitchen which comes fully furnished for all of your cooking needs. Including a wine/beverage refrigerator. The kitchen provides plenty of space to gather around the large island to enjoy the evening spoils or for a more formal affair, gather around the table for a magnificent feast. Large, well appointed bedrooms with private baths and fine linens await you for a wonderful night of deep sleep. Awaken to heavenly views! Front loading large washer and dryer outside of bedroom doors to make getting up and cleaning up easier. We have taken care of the details so you don't have to.